Divided into four sections, the novel relates four adventures of Lemuel Gulliver, a surgeon and sea captain who visits remote regions of the world. In the beginning Gulliver is shipwrecked on the island of Lilliput, where people are six inches tall. Their smallness mirrors their small-mindedness as they spend their time indulging in ridiculous customs and petty debates. His second voyage takes him to Brobdingnag, where lives a race of giants of great practicality who do not understand abstractions; they are horrified when Gulliver recounts the splendid achievements of civilization. Gulliver’s third voyage takes him to the flying island of Laputa, which attacks lands below pelting rocks at them, like modern bombing raids. There he finds pedants obsessed with their own specialized areas of speculation and utterly ignorant of the rest of life. At Glubdubdrib, the Island of Sorcerers, he speaks with great men of the past and learns from them the lies of history. He also meets the Struldbrugs, who are immortal and, as a result, utterly miserable. In the fourth section, Gulliver visits the land of the Houyhnhnms, a race of intelligent horses who are cleaner and more rational, communal, and benevolent than the brutish, filthy, greedy, and degenerate humanoid race called Yahoos whom they have tamed—an eironic twist on the human-beast relationship. 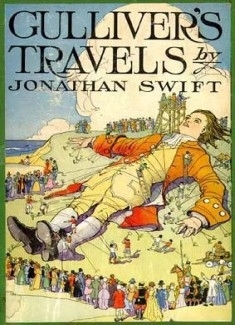 Whether read as a novel, simple travel fantasy, or biting satire, Gulliver’s Travels is one of the most thought-provoking reads in any genre or language. For all its mocking of human foibles, it holds out hope that moral, social, and political progress is perhaps possible if a mirror is held up to humankind’s baser instincts.